Last night on Facebook, I asked whether everyone was rooting for the Seahawks or the Patriots and the results were overwhelming. It seemed like most people were on the Russell Wilson train! I, too, am rooting for the Seattle Seahawks, so I decided to do a little nail art with a few of the holo polishes I recently received in a swap. I used Milani Spotlight White for the base with Colors by Llarowe Bronco Blue (ironic, I know) and Young Grasshoppa. All of these were made using nail vinyls from Up Your Nail. The thumb and ring finger were with vinyls, the other three were made using their nail guides. The only one I struggled with a little was the teardrop guide, but I figured it out a little better after a redo. 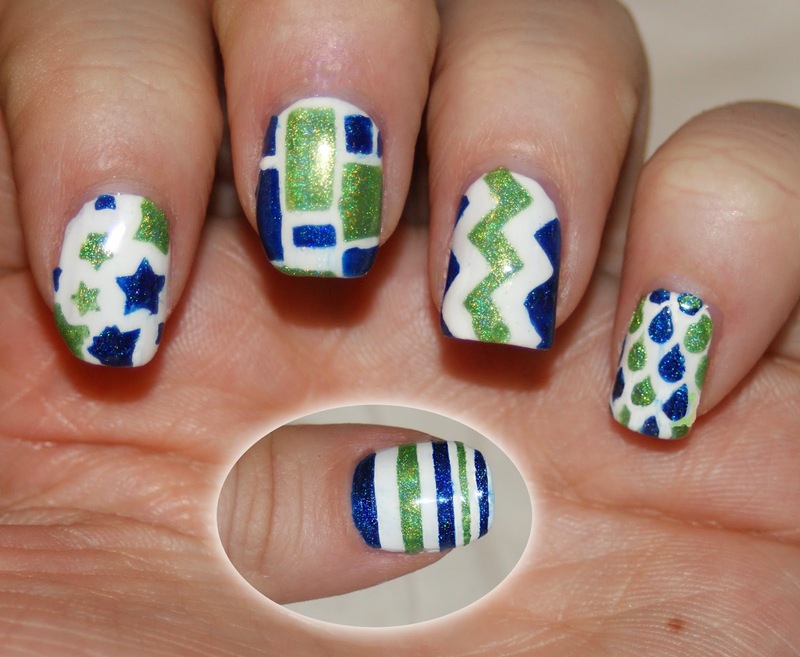 Please let me know what you think of my Super Bowl nail art and feel free to post your nail art to my Facebook page. I'll be sharing some of my favorites throughout the game! Thanks so much! I was going to do something actually football-themed, but at least this I can wear for a few days after!